We, at EDIT PLC, are highly committed to ensuring the health and safety of our employees. We adopted basic health and safety laws and regulations, developed company standards for best practices pertaining to work place health and safety and practiced in all our operations. We train and encourage our employees to conduct activities in a safe and healthy manner. We will regular check and review health and safety objectives and targets. We will regularly update our practices; develop relevant codes of practice, standards and manuals. In any of our field operation locations, prior risk assessment will conduct hazard/safety risk assessments to understand the degree of risk associated with an activity and develop action plans to address the risks identified. We consider any risks to associate with our employee’s health status adjustments. The employees always equipped with the first aid skills and first aid supplies. We provide appropriate PPE to protect employees from reasonably foreseeable health and safety risks in our field operations. Generally, safe work practices, learned early, help reduce the possibility of accidents occurring causing painful injuries, expensive repairs or irreparable damage to machinery or even the well itself. Accordingly, we abide with the basic safety habits to reduce possible accidents and/or injury. Keeping clearly defined barrier for spectators; in addition, a trained driller should also be operating the drill from a position where it is easy to reach all the control levers. Avoid having loose clothing be worn when drilling because it is more prone to catch on sharp or moving objects and personal protective equipment (such as safety hats, gloves and boots) should always be worn. Posting clear and visible sign boards for the basic requirements in our field operation work places. 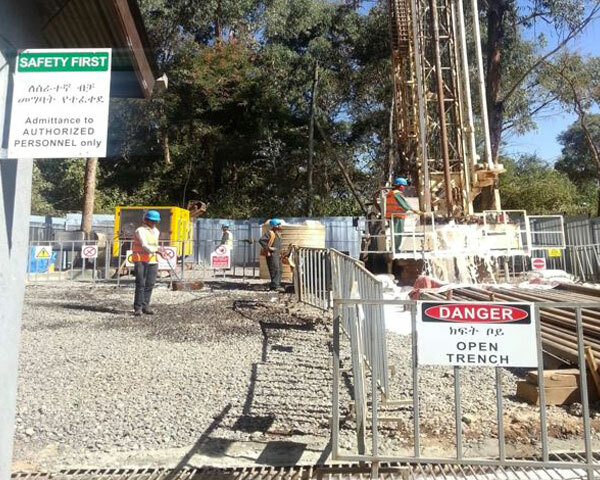 Besides, our drilling operations shall comply with relevant state workplace Health & Safety regulations, like “Safety in Wells and Boreholes” published by the Institution of Civil Engineers and with the relevant provisions of BS5573.